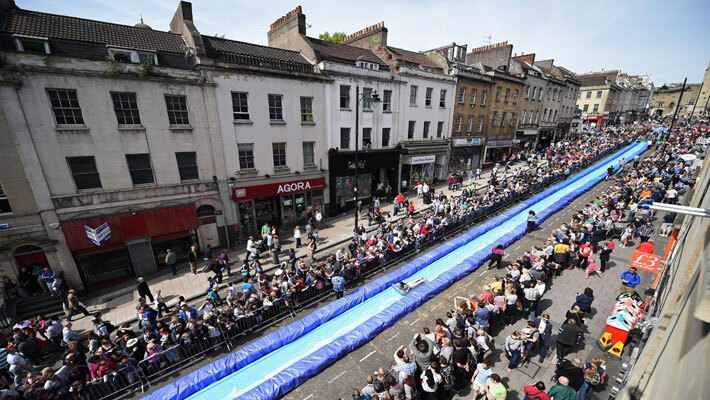 On the 4th May 2014 this giant 95m (300ft) water slide was installed on Park Street in Bristol as part of Make Sunday Special and the Bristol Art Weekender. Running for one day only, it was an event people of the city will remember for many years to come. 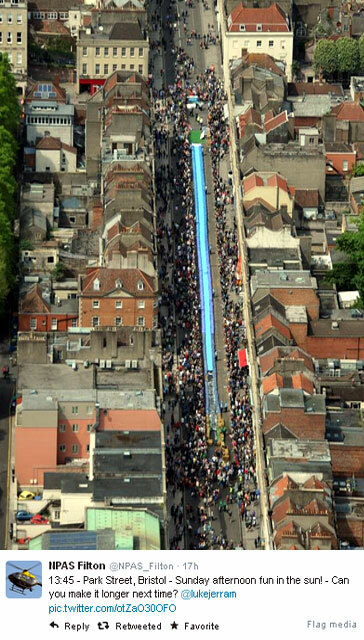 96,573 people signed up for their chance to get a ‘ticket to slide’ and through a ballot, only 360 lucky people were issued with tickets. Security clocked in 65,000 people who came to Park Street to watch the one-day event. Enabling people to navigate the streets of their city in a new way, the slide is a simple architectural intervention and a playful response to the urban landscape. Like many of Luke’s projects the installation requires public participation to be activated. The person on the slide becomes the performer, while spectators either side watch on. The end result is a set of collective memories and stories that people pass on. With an incline of 6.5 degrees, participants slid at an average of 18km/hr = 11.2mph (calculated from this film). The slide was used by children and adults ranging in age from 5 to 73 years old. 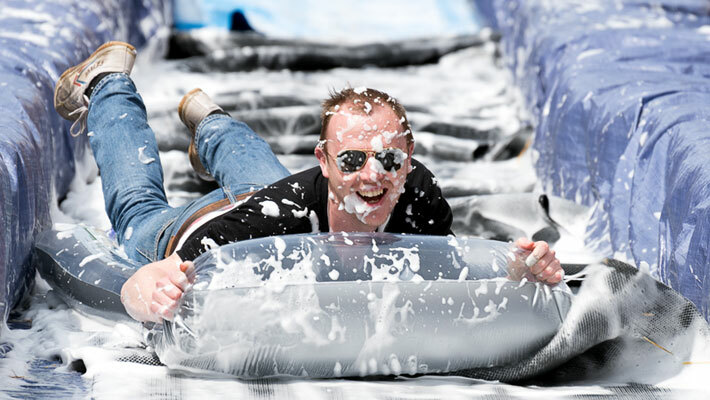 To enable organisations around the world to create their own ‘urban slide’, an 80 page pack of instructions has been created. The pack contains diagrams, risk assessments, a method statement, budget template, waiver form and everything needed for planning and delivering a slide. In return for the information, you will pay a small admin fee and make a donation to the charity Frank Water. Contact us here via email about receiving this DIY manual. Bristol based charity FRANK Water were at the Park and Slide event, complete with blue wigs and collection buckets and raised a huge £1500 on the day. 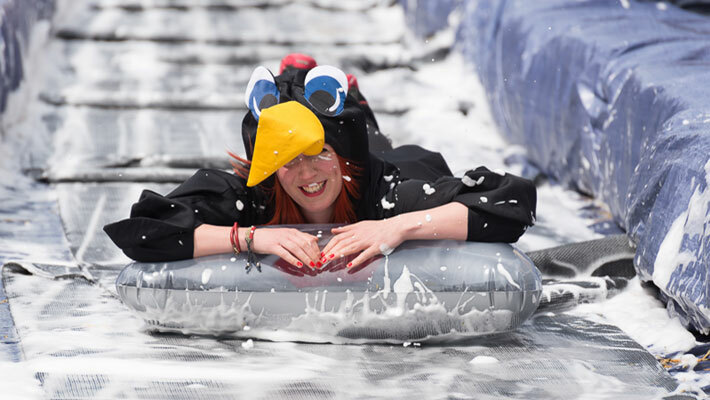 The DIY pack, which has proved vital for helping other organisations get their slide projects off the ground, has already raised a further £2500 for the charity. The art project was funded in part through this Spacehive crowdfunding campaign. Thanks to all who donated! As described in the press, Luke turned down funding from major corporate sponsors, in favour of gathering local support for the project. ‘Park and Slide’ was not an opportunity to advertise fizzy drinks, swimming trunks or holidays to anyone. 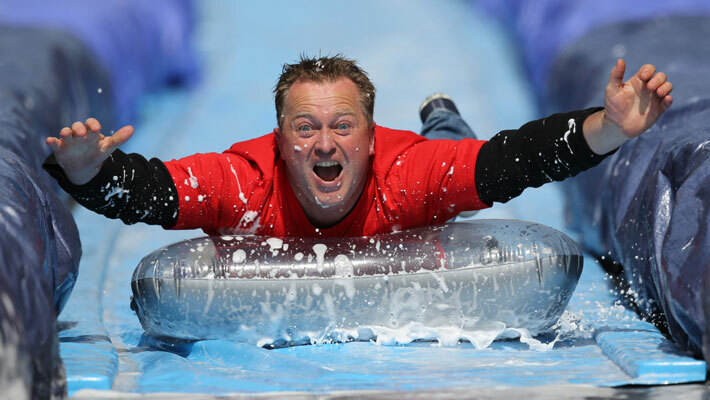 Over 600 million people around the globe heard about the slide through the 350 news and press articles about the slide. Here are few links: BBC, ITV, Telegraph, Metro, DailyMail, Mirror, Independent, Guardian, Daily Mail, The Metro, Washington Post, NBC News, USA Today, Daily Express, BBC One Show, NHK Japanese TV, NPR, Repubblica Italy, + 350 more news articles here. Guardian, ITV News (watch), USA Game Show, BBC Radio (Listen) , China News, Yahoo News, Gizmodo, BBC, Designboom, Bristol Evening Post, Guardian-Crowdfunding story. Journalists and bloggers can download these images for free for your use. Or here are some from Getty you’d need to pay for. Contact luke@lukejerram.com for further information. Here is the press release from the day. We would like to thank the following local organisations and companies for their kind support. Funding to help pay for additional security on site, came from Business West. Cowbells were provided by Hobgoblin Music Shop. Funding from EveryoneActive enabled a durable slide section to be made. Insurance was provided by Park Insurance. SpiritPR have managed the press and media with great finesse! Thank you Entuplet for managing the ballot and ticketing. Thanks of course also go to Bristol Event Volunteers, Bristol City Council, Richmond Event Management and AP security. 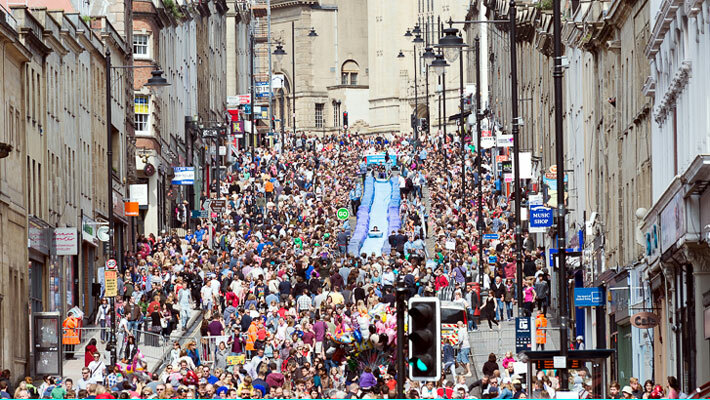 As news of Park and Slide spread around the globe, other cities were inspired to install their own urban slides. Our DIY pack has proved vital for many of these organisations in helping to get their project off the ground. See links for urban slides in San Francisco, Perth, Brechin, Sunderland, Camarthen, Lincoln, Bray, Derby, Chard, Derry, Wigan, Dungannon, Bristol USA, Salt Lake City, Melbourne, Port Hope-Canada, Norwich. Cancer Research UK and the RNLI have used our DIY pack to tour slides across the country raising hundreds of thousands for their charities! 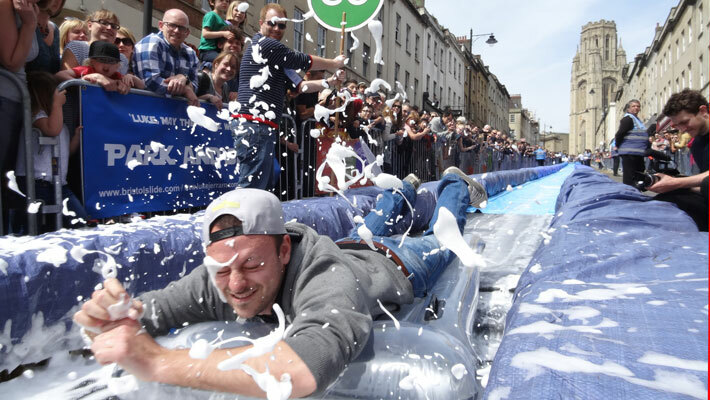 As a consequence of the success of Park and Slide, several commercial companies have sprung up, installing slides in cities across the globe. It has become a multi-million dollar business!